As well as all of the amazing line ups that Sway Allstars Orchestra offer, we can go as “intimate” or as “wow” as you like. Depending on the venue, type of event and how many people you are entertaining, we can accommodate whatever effect and layout you would like to achieve. Picture your wedding for instance – perhaps you have an outside venue, abroad or in the UK, but something a little different from a traditional church wedding. You would love fresh and beautiful music and want to hire a solo pianist so that you can bespoke live music, to create a stylish and stunning experience. Just one discreetly placed musician playing your favourite pieces of music; when you walk down the aisle, during the signing of the register and then again when you are walking out as a married couple. A solo pianist is also really lovely for the start of a wedding breakfast, when all the guests are mingling and the wedding couple have finally relaxed and can enjoy their day. This sort of live music is absolutely ideal for a more relaxed and personal wedding. Maybe a humanist wedding, a civil ceremony, a beach wedding or a vow renewal. Whether it’s in the UK or abroad, our talented pianist will ensure that your wedding will be something to remember. A solo pianist is ideal for probably any event you can think of – perhaps a corporate evening, an awards night, charity event, product launches or any other day or evening ceremony that you may be organising, will all benefit from live background music. The venue could be small and intimate and there is not room for one of our larger line ups within Sway Allstars. So why not hire a solo pianist to give you the background music you love. A discreet but totally professional pianist who can offer the playlist you require for your event, spanning over 40 decades. Or perhaps you require live music at the start of the evening, while your guests arrive, with the full size band playing later in the evening. Maybe even in the foyer at the start of the night whilst you welcome your guests and then moving into the next room for the main event later. 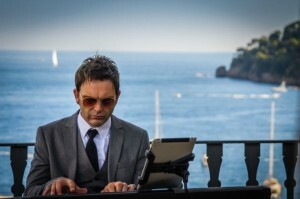 If you are looking to hire a solo pianist, then Sway Allstars can be your only choice. Please call us on 01435 408083 or just fill in our enquiry form and someone will be in contact to book a band for you.